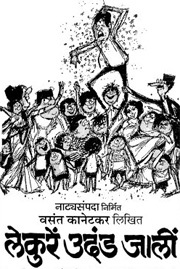 Lekure Udand Jhaali is another Vasant Kanetkar play which has been revived. The original play completed over 1000 shows & the lead roles were played by Shrikant Moghe & Daya Dongre. It is a three part play with Sumit Raghavan & his wife Chinmayee Sumit as leads. The story revolves around a rich, childless couple, Raja & Rani Tambe. The couples greedy relatives presume that as the Tambes do not have any children, their kids will inherit all their property. Slowly & steadily the relatives create situations to suit their purposes & manipulates Rani’s intense desire to have kids so that she ends up agreeing to adopt one of her sisters many kids. On the other hand Raja’s brother is playing a similar trick on him. This leads to a fight between the couple on whose kid should they adopt? His brothers or her sisters? However when Raja loses his wealth in some bad investments the sweet relatives are quick to show their true colors. With poverty the Tambes are rid of their false relations. However even in these adverse times the servant in their house refuses to leave them for he considers himself a part of the family. The play ends on a happy note when Rani discovers that she is pregnant. They are poor & lonely now; but this one joy infuses hope & enthusiasm in their lives. Raja resolves to start his life afresh so that he can give his baby the best things money can buy. Sumit Raghavan is a great actor & singer. The supporting characters are well selected & each person does his role well. I liked the servant most! Two serious issues, being childless & greedy, selfish relations, are presented in a lighter vein. Though comedy is used it does not look insensitive. Pain as well as ridiculous emotions are well presented & portrayed. Personally I like poetry to be flowing, complete with rhyming words & all. The songs used use words like prose. My Mom told me this was a new experiment when this play was first introduced nearly 30 years back. In those times ‘Sangeet Natak’ (entire plays based on raagas & in poetry form) were popular. So this was an attempt to put music to prose. You can call it a Marathi Musical! I would have preferred plain dialogues! The sound quality wasnt very good. At some points I had to strain my ears to hear what was being said. Sumit is excellent with his singing. However Chinmayees voice was pre – recorded & sometimes the recording was really bad! I will give it an 8 / 10. A nice play!